Caption slip reads: "Photographer: Rustan. Date: 1958-03-02. Reporter: Farrell. Assignment: Dog vaccinations. 30-93-5-6-29: Vets run through some 2400 dogs for rabies vaccination at Ann Street Shelter. 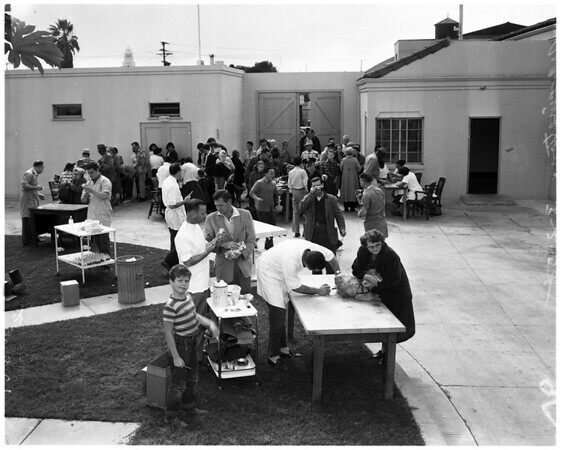 43-44-94: Dog owners with their dogs formed a line for four blocks around Ann Street Shelter as volunteer vets from the Southern California Veterinary Medical Association give shots to dogs".